User165340 gave this 5 stars! 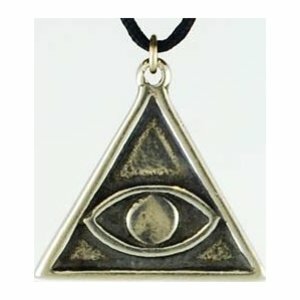 This amulet is an All Seeing Eye within a triangle that helps protect the bearer against the evil eye cast by others whom may wish them harm. The Avert Evil Eye is charged with protective energies and comes with a black cord so that it may be worn as a necklace or used as a charm. This item is approximately 1 inch in length. This is a must have for casual strides through life, because if you are a practitioner, you are going to run into some unwanted attention. By two and make them into earrings. It is worth the buy and worth the small adaptation. Heck, put it on a bracelet. Priceless; trust me!